No HTML - Easy Drag & Drop Setup. Zero HTML Programming Required! Drive more leads & convert them to sales with our drag & drop interface & dozens of templates, form types, and popups for sales lead generation, free offers, newsletters, surveys, job applications & more. If you’re a pro marketer or a small business owner ramping up sales lead generation, you’ll love our A/B split testing, integrated autoresponders and lead scoring, webinar or event RSVPs and more. While there are dozens of form generators out there, sales lead generation is our #1 focus. Easily create bait offers, “$7 tripwire” offers, landing page toppers, viral curation piggybacks, timed popovers, exit pops, scroll-intent pops, call-to-action offers & more in minutes on any site, or use our free Wordpress marketing plugin. Easily create multi-step workflows to collect online payments, then flow to a setup form, then auto-generate an e-Signable sales contract using Swift Signature followed by a thank you page on your own site - or whatever workflow you need to reach your sales goals. Convert any document to a fillable form with single-step or multi-step online form-fills, auto-export to PDF and/or database, emails, APIs, and more, along with optional legally-binding e-signature integration - all with tablet-friendly / mobile-friendly design. 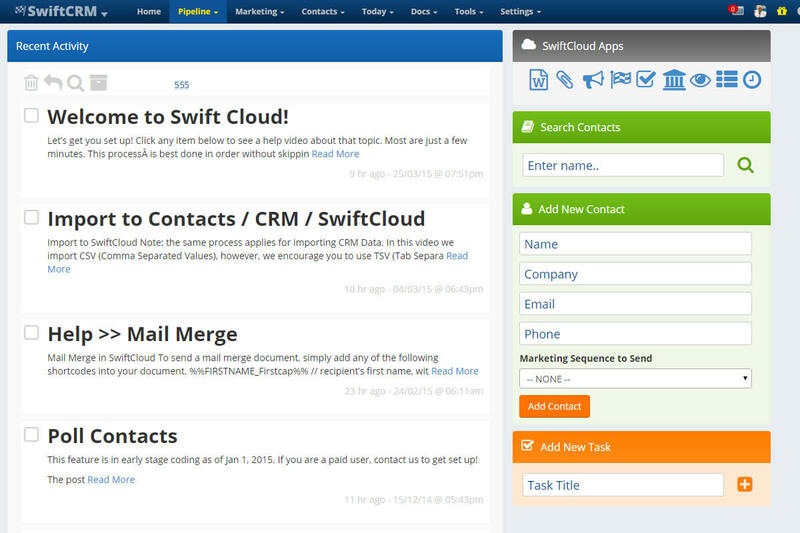 Swift Form is 100% integrated into SwiftCloud’s business productivity platform - including the centralized contact manager, CRM, accounting, invoicing, e-signature, marketing suite, task & projects manager - or auto-export via APIs, CSV spreadsheet, emails & more. Every form is automatically published online, no website required, but can be secret, public, or locked and invite-only per your settings. Publish to Wordpress in just a few clicks, or any other website in just a few more. Advanced options like single question at a time “progressive slides” with conditional if-then logic, zip code auto-convert to city / state, hidden fields to detect GPS location, browser language settings, marketing tracking fields passed through & more - all while looking great. Pass through Google Analytics data, test ideas with A/B split testing, then refine winners to make steady gradual improvement to marketing responses. Track marketing campaigns across multi-sites and multi-campaigns & even swap phone numbers to track response on-the-fly based on incoming URL data. Optional Swift Schedule integration allows users to choose a date based on calendar rules and your real-time availability, optionally pay for scheduling, then automate reminders on a pre-set campaign & auto followup. Just want party RSVPs? We’ve got that too. Currently in invite-only-beta as part of SwiftCloud.AI is chat forms - so you can collect and engage with your audience using real-world language (“yeah” = yes) piped in via email or live chat. Naturally, all chat is integrated with Swift Marketing’s lead scoring. Optionally add Swift Reviews Wordpress plugin to automate conditional-logic followup to sales and engagement. If the reviews are good, syndicate it out & pipe it to your marketing department - and ask for referrals. If it’s less than stellar, open a Swift Helpdesk trouble ticket to handle before damage control or online reputation becomes an issue. For agencies, our forms can be CSS overwritten, locally cached with API submission with local-wordpress “safety net” submission-tracking and more. Connect APIs to GoToMeeting, Twilio, & other tools. Don’t know what this means? Ask us about our talent marketplace to get this to work for you. We don’t sell software. We sell improvement to your business, usually with directly measurable ROI. We pride ourselves on high availability, while covering the basics so you don’t have to. Custom setup and custom programming are available, and we’re committed to your success.